Production: Wark Producing Company, some sources list studio as Epoch Releasing Corp.; black and white (with some scenes tinted in original release prints), 35mm, silent; running time: about 220 minutes, some versions are 129 minutes, original version 8 hours. Released 5 September 1916, New York. Filmed fall 1914-July 1916 in Hollywood, basically on outdoor sets constructed by Griffith and his crew. Cost: about $386,000, though figures differ in various sources. Re-released with new score by Carl Davis, London Film Festival 1988. Producer: D. W. Griffith; scenario: D. W. Griffith; photography: G. W. (Billy) Bitzer and Karl Brown; editors: James and Rose Smith; production designer (set decorator and architect): Frank Wortman; art directors: Walter L. Hall and others; music score which accompanied the film on its initial release: Joseph Carl Breil and D. W.
Griffith; assistants on film: Eric von Stroheim, W. S. Van Dyke, Tod Browning, Joseph Henabery, Edward Dillon, George Siegman, Lloyd Ingraham, and others. Cast: The Modern Story : Mae Marsh ( The Dear One ); Robert Harron ( The Boy ); Fred Turner ( The Girl's Father ); Sam de Grasse ( Jenkins ); Vera Lewis ( Miss Jenkins ); Walter Long ( Musketeer of the Slums ); Ralph Lewis ( The Governor ); Monte Blue ( Strike Leader ); Tod Browning ( Race car owner ); Miriam Cooper ( The Friendless One ). The Babylonian Story : Alfred Page ( Belshazzar ); Constance Talmadge ( The Mountain Girl ); Elmer Clifton ( The Rhapsode ); Seena Owen ( The Princess Beloved ); George Siegman ( Cyrus the Persian ); Tully Marshall ( High Priest of Bel ); Carl Stockdale ( King Nabonidus ); Elmo Lincoln ( Mighty Man of Valor ); Jewel Carmen, Carol Dempster, Mildred Harris, Alma Rubens, Pauline Starke, Eve Southern, Natalie Talmadge, and Anna Mae Walthall ( Slave girls and dancers ); Frank Campeau, Donald Crisp, Douglas Fairbanks, DeWolfe Hopper, Wilfred Lucas, Owen Moore, Sir Herbert Beerbohm Tre, Tammany Young, others ( Soldiers, courtiers, etc. ). The French Story : Margery Wilson ( Brown Eyes ); Eugene Pallette ( Prosper Latour ); Spottiswoode Aitken ( Father ); Ruth Handford ( Mother ); Josephine Crowell ( Catherine de Medici ); Frank Bennett ( Charles IX ); Maxfield Stanley ( Duc d'Anjou ); Constance Talmadge ( Marguerite de Valois ). The Judean Story : Howard Gaye ( The Nazarene ); Lillian Langdon ( Mary ); Olga Grey ( Mary Magdalene ); Bessie Love ( Bride of Cana ); George Walsh ( Bridegroom ); W.S. Van Dyke ( Wedding guest ); Lillian Gish ( The Woman Who Rocks the Cradle ). Griffith, D. W., Intolerance: Shot-by-Shot Analysis by Theodore Huff , New York, 1966; narrative scheme also published in Cahiers du Cinéma (Paris), Spring 1972. Lindgren, Ernest, The Art of the Film , New York, 1963. Gish, Lillian, The Movies, Mr. Griffith, and Me , New York, 1969. O'Dell, Paul, Griffith and the Rise of Hollywood , New York, 1970. Griffith, D. W., The Man Who Invented Hollywood: The Autobiography , edited by James Hart, Louisville, Kentucky, 1972. Henderson, Robert, D. W. Griffith: His Life and Work , New York, 1972. Bitzer, Billy, His Story , New York, 1973. Brown, Karl, Adventures with D. W. Griffith , New York and London, 1973; revised edition, 1988. Niver, Kemp, D. W. Griffith: His Biograph Films in Perspective , Los Angeles, 1974. Wagenknecht, Edward, and Antony Slide, The Films of D. W. Griffith , New York, 1975. Graham, Cooper C., and others, D. W. Griffith and the Biograph Company , Metuchen, New Jersey, 1985. Drew, William M., D. W. Griffith's "Intolerance": Its Genesis and Its Vision , Jefferson, North Carolina, 1986. Gunning, Tom, D.W. Griffith and the Origins of American Narrative Film: The Early Years at Biograph , Champaign, 1991. Leondopoulos, Jordan, Still the Moving World: Intolerance, Modernism, and Heart of Darkness , New York, 1991. Simmon, Scott, The Films of D.W. Griffith , New York, 1993. Schickel, Richard, D.W. Griffith: An American Life , New York, 1996. New York Times , 6 September 1916. Soule, George, in New Republic (New York), 30 September 1916. Dell, Floyd, in Masses (New York), November 1916. Bitzer, Billy, in International Photographer (Los Angeles), October 1934. Joad, C. E. M., in New Statesman and Nation (London), February 1949. Trewin, J. C., "Rush Hour in Babylon," in Sight and Sound (London), Spring 1949. Feldman, Joseph and Harry, "The D. W. Griffith Influence," in Films in Review (New York), July-August 1950. Dunham, Harold, "Bessie Love," in Films in Review (New York), February 1959. Esnault, Philippe, in Cinéma (Paris), 1960. Tozzi, Romano, "Lillian Gish," in Films in Review (New York), July-August 1962. Bodeen, DeWitt, "Blanche Sweet," in Films in Review (New York), November 1965. Meyer, Richard J., "The Films of David Wark Griffith," in Film Comment (New York), Fall-Winter 1967. Oms, Marcel, "Essai de lecture thematique de Intolérance ," in Cahiers du Cinéma (Paris), Spring 1972. "Dossier Intolérance ," in Cahiers de la Cinémathèque (Perpignan), Spring 1972. Bruno, E., in Filmcritica (Rome), November-December 1972. Hanson, Bernard, "D. W. Griffith: Some Sources," in Art Bulletin (New York), December 1972. Beylie, Claude, in Ecran (Paris), February 1973. Stern, Seymour, "D. W. Griffith's Intolerance : A Sun-Play of the Ages," in The Essential Cinema , New York, 1975. Belluccio, A., " Cabiria e Intolerance ," in Bianco e Nero (Rome), May-August 1975. "Griffith Issue" of Films in Review (New York), October 1975. Kepley, Vance, Jr., " Intolerance and the Soviets: A Historical Investigation," in Wide Angle (Athens, Ohio), no.1, 1979. Merritt, Russell, "On First Looking into Griffith's Babylon: A Historical Investigation," in Wide Angle (Athens, Ohio), no.1, 1979. Pym, John, in Monthly Film Bulletin (London), May 1979. Belaygue, C., and others, "Redecouvrir Intolérance ," in Cinéma (Paris), 27 November 1985. Chevrie, M., "Le Miroir du muet," in Cahiers du Cinéma (Paris), December 1985. Hansen, M., "The Hieroglyph and the Whore: D. W. Griffith's Intolerance ," in South Atlantic Quarterly (Durham, North Carolina), no. 2, 1989. Leondopoulos, J., "Lost in a Climate of Opinion: Intolerance Revisited," in Literature/Film Quarterly (Salibury, Maryland), no. 2, 1990. Everson, W. K., in Films in Review (New York), January-February 1990. Bassetti, S., "Una questione di omogeneita," in Filmcritica (Rome), November 1990. Toeplitz, Jerzy, "Wspaniale widowisko: Kalendarz filmowy," in Iluzjion , no. 3–4, July-December 1991. Werner, Gösta, " Intolerance och Griffiths sax," in Filmrutan (Sundsvall), vol. 36, no. 3, 1993. Dupre la Tour, C., "The Written Word and Memory in Griffith's Intolerance and Dreyer's La passion de Jeanne d'Arc ," in Iris (Iowa City), no. 19, Autumn 1995. Merritt, R., "'Bloody Ludlow' auf der Leinwand," in KINtop , vol. 6, 1997. Ent, M. van der, "Muzikaal commentaar," in Skrien (Amsterdam), no. 212, February/March 1997. Critical judgment remains sharply divided on Intolerance , D. W. Griffith's most expensive and flamboyant spectacle. Those critics who pronounce the film a failure generally point to the four stories, which, they claim, are thematically too diverse to be effectively collated. Taking their cue from Eisenstein's famous indictment, they argue that the film suffers from purposeless fragmentation and thematic incoherence. Others, notably Vachel Lindsay, Georges Sadoul, Edward Wagenknecht, and more recently Pauline Kael, list Intolerance among the masterworks, stressing its formal complexity, experimental daring, and thematic richness. René Clair, taking a middle position, writes, "it combines extraordinary lyric passages, realism, and psychological detail, with nonsense, vulgarity, and painful sentimentality." Historians agree, however, that Intolerance remains Griffith's most influential film, and that among its most precocious students were the Soviet directors of the 1920s. As Vance Kepley states, "When Intolerance was shown in the Soviet Union in 1919, it popularized a montage style already evolving in the hands of Soviet artists. It was reputedly studied in the Moscow Film Institute for the possibilities of montage and 'agitational' cinema (agit-film) and leading Soviet directors, including Eisenstein, Pudovkin, and Kuleshov, acknowledged a debt to Griffith in their writings." True to his customary practice of starting one film while finishing another, Griffith began work on Intolerance while editing The Birth of a Nation in the fall of 1914. Intolerance began with the modern story, originally entitled "The Mother and the Law." It was intended as a companion piece to The Escape (released by Mutual earlier that year), a study of white slavery and the corruption of city slums. "The Mother and the Law" was virtually completed before The Birth of a Nation was released. Not until May, 1915, after Birth 's controversies were at their peak, did he resume work on it. Determined to surpass the Civil War movie, he decided to expand his modern story to epic proportions. He built lavish sets (notably, the Mary Jenkins ballroom and the Chicago courtroom) and—most important—expanded the story to include the famous strike sequence. This was, in part, an effort to capitalize on the headlines surrounding John D. Rockefeller, Jr., who had been called up before the Commission on Industrial Relations to explain his role in the 1914 Ludlow massacre. Intolerance 's strike is loosely based on this incident, in which 23 striking employees of Rockefeller's Colorado Fuel and Iron Company were shot down by the national guard. In these new sequences, Griffith also attacked the Rockefeller Foundation, which, like its founder, came under severe public criticism as the creation of a hypocritical plutocrat, a philanthropy paid for by the exploitation of workers to enhance the reputation of their taskmaster. Griffith continued shooting his modern story through the summer of 1915. Meanwhile, he began work on a French story, directly patterned after Meyerbeer's Les Huguenots which had enjoyed great popularity at the Metropolitan Opera with Caruso and Toscanini. Originally, this was to be the lustrous counterpoint to the drab modern story. In original prints, the interiors of the Louvre palace were hand-tinted, while considerable attention was paid to royal costumes and lavish Paris sets. Not until the end of the year did he begin his most elaborate and expensive story. 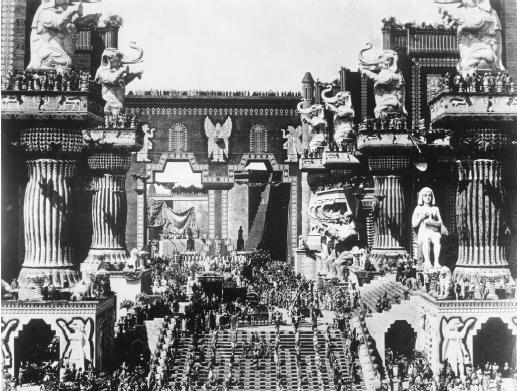 The Hall for Belshazzar's Feast has become perhaps the best-known set created for a silent film. Griffith had his set festooned with Egyptian bas-reliefs, Hindu elephant gods, and Assyrian bearded bulls. Practically every Near Eastern style was represented somewhere on the walls or in the costumes—except the styles of Babylon. Until Douglas Fairbanks's castle set for Robin Hood, it remained the largest backdrop ever created for a movie scene. The result, when combined with the Passion sequence, was a conglomerate of stories and styles in search of a unifying principle. Part morality play and part three-ring circus, the movie was part of the new eclectic aesthetic that had all but buried the older ideal of organic synthesis. Along with Scott Joplin's Treemonisha and Charles Ives's Third Symphony, it remains one of the period's great hybrids. As such, it won uniformly enthusiastic critical notices, but proved disappointing at the box office. Produced at a cost of $386,000 (almost four times the expense of The Birth of a Nation ) and endowed with an extraordinary cast, it left audiences cold. Although the film cost considerably less and earned more than historians have generally reported, Griffith himself was convinced he had failed. Two years after its release, he released the modern and Babylonian episodes as two separate films. Traditionally, these productions have been dismissed as footnotes to Intolerance , simple attempts to relieve the producer of Intolerance 's burden of debt. Several recent critics, however, have argued that the modern story—released as The Mother and the Law —is improved when separated from the other stories and should be evaluated as a self-contained feature. Griffith was the most eclectic of American directors, an artist whose work consistently absorbed and reflected American popular culture. Of all his films, Intolerance remains the one most firmly rooted in its own time, a work representing the cultural phenomena of its day. Probably no film before Citizen Kane touched on as many aspects of American popular taste. Griffith's instincts cannot be called infallible. In his sweeping dragnet of the fine arts, he intuitively missed every important art movement of his time; the raw materials he gathered were an unsorted miscellany of official art treasures (like the Cluny unicorn tapestries and the Assyrian winged bulls) and parochial 19th century kitsch . As a muckraker, he had trouble distinguishing important social evils (like America's bloody labor wars and horrible prison conditions) from ephemeral parochial problems. The demons he fought most bitterly, like the Anti-Saloon League, the Rockefeller Foundation, and settlement workers, represented issues far more complex than he ever perceived. He had infinite charity for prodigals, but none for Pharisees, and he depicts "uplifters" as onesidedly in Intolerance as he depicted blacks in The Birth of a Nation . Today, Intolerance is usually discussed according to memorable isolated sequences, notably Belshazzar's feast, beginning with its famous crane shot; the strike sequence; the courtship of Mae Marsh and Bobby Harron; the courtroom scene with the famous close-ups of Mae Marsh's hands; and the Babylonian battles. Although considerable attention has recently been paid to Griffith's treatment of miseen-scène, the most durable aesthetic debate continues to center on his intercutting techniques, especially the rhythmic climax built on four intertwined catastrophes, one averted, the others not.